After living through a decade of dismal market performance, it can feel like the odds are stacked against the individual investor. Many invest simply because they are told it is the wise thing to do but honestly do not trust the markets. Other investors get burned by poor advice or an ill-timed decision to sell or buy. 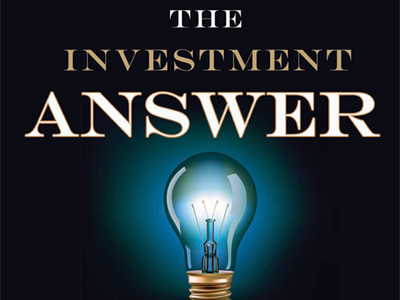 The Investment Answer by Daniel C. Goldie and Gordon S. Murphy shows how financial markets can become your ally rather than your adversary. Goldie and Murphy review five basic but key decisions that will help you to sort through all of the financial opinions (we call this “noise”) and improve your returns. This book is recommended reading for all of our clients. Goldie and Murphy point out that investors have a poor track record of underperformance. They cite a Dalbar study that reports the S&P 500 returned 8.2% from 1990 to 2009, but the average stock fund investor only saw a 3.17% annual return. Ouch. They conclude that abusive fees eat away at returns but that the more destructive enemy is often our own natural instincts. For those that choose to seek advice, the authors make sure that readers understand the difference between seeking advice from brokers and independent advisors. They recommend choosing an advisor who is legally bound to offer advice that is in the client’s best interest. They state, “A broker is working for his firm. An independent fee-only advisor is working for you.” We couldn’t say it any better. I found the historical results of different hypothetical portfolios to be helpful at the end of this chapter. A big barrier to investment success is that many novice investors have unrealistic expectations for a portfolio that achieves significant growth with limited downside risk. Everyone knows the importance of being diversified, which is why Goldie and Murray stress what they call “effective diversification.” Investing in 10 tech companies during the late 1990s was a form of diversification, but these investors soon discovered the failure in this strategy. Effective diversification helped win Harry Markowitz a Nobel Prize for his work on modern portfolio theory, which is too complex to describe here, so read the book! No one likes to be average but even worse is finishing last. We all live with an incessant desire to outperform those around us, to stand out. Goldie and Murray point out that this desire drives many to seek active managers with impressive credentials to manage their assets. The problem with this strategy is that the data suggest a stunning percentage of fund managers fail to beat the market average. Some start raising their fees to capitalize on their past success. Other money management stars see their lucky streak run out. We generally follow a passive strategy and use index-based funds to keep expenses low. However, one weakness of the purely passive approach is that you would equally weight similarly sized countries in your portfolio no matter what their economic policies. We prefer to overweight countries with the fertile soil prepared by prudent debt levels and an economic environment that is conducive to entrepreneurial risk taking. Investors know you should buy low and sell high, but in reality it is very hard to sell a position that has grown significantly and invest this money in another position that has performed relatively poorly. But as Goldie and Murray point out, “Rebalancing is an automatic way to buy low and sell high, without your emotions getting in your way.” Want proof that rebalancing works? From 1990 to 2009, an annually rebalanced portfolio returned 17.6% more than a static portfolio. Over time, the markets can work for you, but there are many pitfalls for the average investor. We agree with the conclusions of The Investment Answer. You need to stack the odds in your favor, and there are some simple principles that anyone can use do this. There is an answer, and it’s worth reading about! Does Every Client Get Put Into One Of A Few Investment Allocations?